This operation is usually performed as a day case procedure under general anaesthetic. Patients are normally admitted on the morning of surgery and may go home later that evening. Three small incisions (5-10mm), are used. The aim of surgery is to restore near normal anatomy to the shoulder to allow harmonious balanced interaction between all structures within the joint. 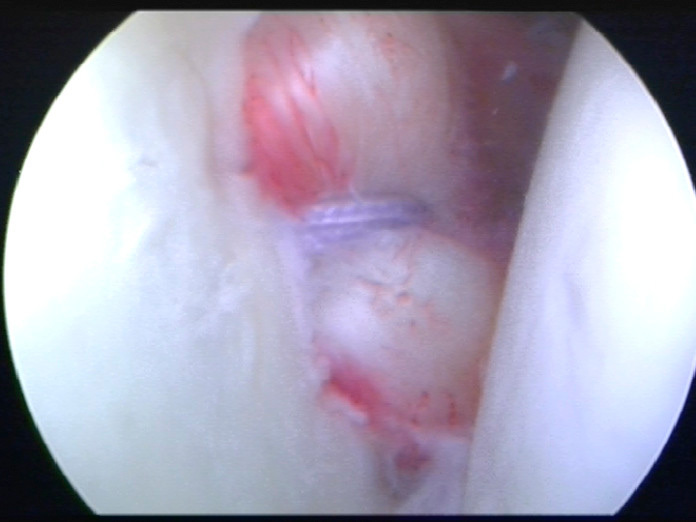 Frequently the antero-inferior labrum has been torn off the glenoid (socket) and gets stuck down elsewhere. This de-tensions the anterior capsule leading to both structural insufficiency and loss of proprioceptive feedback from the shoulder joint capsule to the brain. The aim of surgery is to both restore the structural anatomy and re-tension the capsule ( a bit like tightening up a guitar string). The anaesthetist will administer a general anaesthetic. made. The skin is prepared with an antiseptic solution. A suprascapular nerve block is performed to reduce postoperative pain. 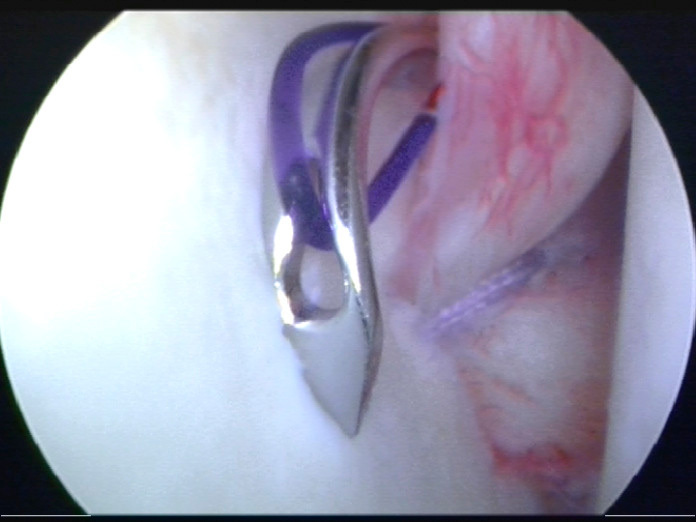 The arthroscope (camera) is inserted into the shoulder joint through a small posterior portal. Direct visualisation of all structures is performed. allow access for surgical instruments. 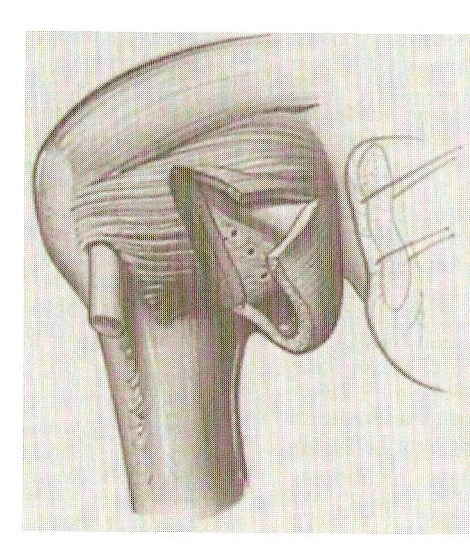 The labrum is mobilised from its abnormal position. time tightening some of the anterior capsule. administered and the two anterior portals are sutured. Complications following arthroscopic stabilisation are not common. 1. You will wake up in recovery with your arm in a sling. 2. You will have an absorbent dressing and Icepack applied to your shoulder. beneficial in reducing inflammation and pain for up to 72 hours. 5. You may require regular analgesia for several days post surgery. medication as these may interfere with the healing of the labrum to the bone. 6. Two weeks post surgery the sutures from the anterior portals are removed. 7. The sling is worn for a total of four weeks. 8. Following surgery you will undergo as supervised physiotherapy program. Lifting: Light lifting: 3 weeks. Heavy lifting: Avoid for 3 months. Return to work: Sedentary job: as tolerated. Light duties: as tolerated after 6 weeks. Open stabilisation is performed if arthroscopic repair is not advisable e.g. 3. HAGL (Humeral Avulsion of inferior Gleno-Humeral Ligament). 1. An 8 – 12 cm anterior incision is made. 2. The subscapularis tendon is divided and dissected free from the underlying capsule. 3. 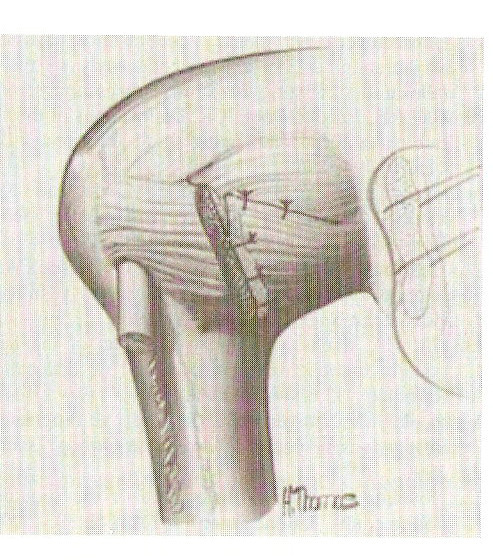 An L – shaped incision is made in the capsule to allow access to the shoulder joint. 5. The rotator interval is closed. 6. The subscapularis tendon is repaired.